So you’re heading out on a family adventure. Perhaps you’re road-tripping across your state or maybe you’re flying half way across the world. You’ve carefully planned out your itinerary; what you’ll see and what you’ll do. Then the unexpected happens. Someone gets sick or hurt. Have you been there? We sure have! And we’ve learned a thing or two. So now we always travel with what we call our mini-medicine cabinet. It doesn’t eliminate the unplanned, but it certainly makes it easier to get through. When I think back to health struggles we’ve had on the road a couple of incidents stand out in particular. There was that time when one of our boys had a high fever. It came on suddenly and we were literally out in the middle of nowhere. Staying at a little bed and breakfast outside of Capitol Reef National Park in Utah, we soon learned that the closest urgent care or even drug store was about two hours away. 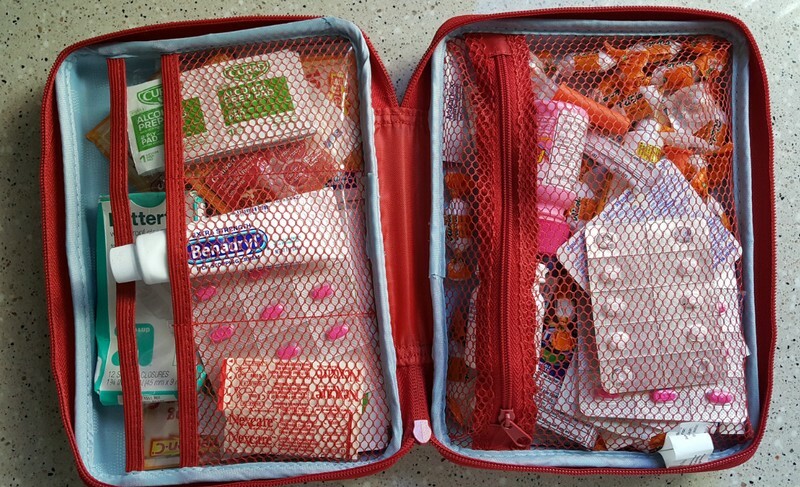 We had to rely on what we had and I was thankful we had packed the children’s Acetaminophen. That, some cold wash cloths and prayers is what got us through the night. Another time that stands out was when one of our boys split his knee open by falling on a rock at the top of Mammoth Mountain during a hike. At best we were 45 minutes away from getting back to town, so the bottle of water, gauze and butterfly bandages we had did the trick until we could get down the mountain. I don’t know what we would have done otherwise. Kids aren’t the only ones who get sick. Recently my father-in-law came down with a bad cold while traveling through Austria and the Czech Republic. You wouldn’t think that purchasing the cold medicine he likes to use at home would be that difficult to find there. But it was! It turns out that the Czech Republic only sells over-the-counter medication at hospital pharmacies and Austria also has some restricting rules about access. There was also a language barrier in both places. And while most people we encountered at tourist destinations spoke English, we didn’t encounter one English speaker in any of the pharmacies we visited. It was a real hassle. It would have been so much easier if we had just gone prepared. 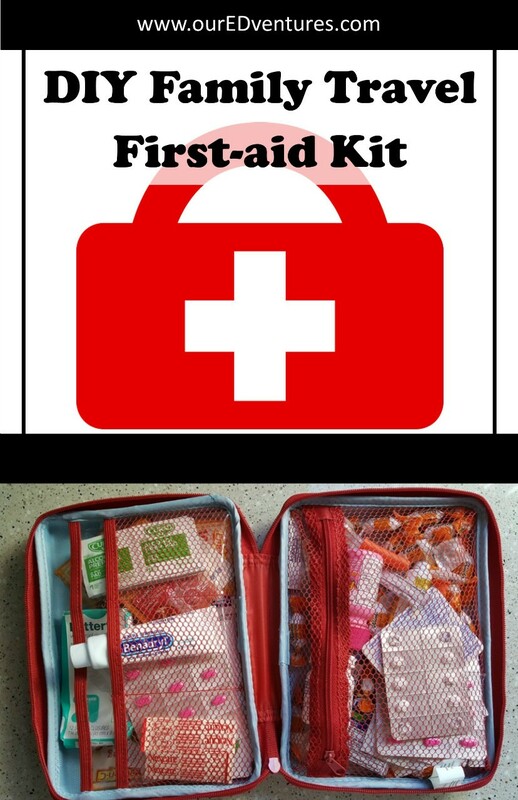 Here are our tips for making your own traveling medicine cabinet. When trying to decide what to include in your pack, consider anything your family has needed in the past year. Cold medicine, fever reducers, cough drops, allergy medicine are some of the common items. This is a good place to start because you know what your family typically uses over the course of a year. You know the unique needs of your family. Remember to pack the specific items that each family member uses. This includes prescriptions, vitamins, epipens, etc. If someone in your family is prone to constipation, this often gets worse with travel. Certain over-the counter aids are helpful to have on hand. Think through what each of your family members use on a regular basis. Many products for children include a chew-able version of the medicine instead of a liquid. This is the best choice for travel for so many reasons. There are no messy, sticky cups to try and manage, no liquid concerns with air travel, and no spills. Find a portable case that will fit everything you have gathered. It can be a simple zipper pouch or even a ziploc bag. It’s helpful to have everything in one place instead of spread throughout your luggage. It also makes it convenient to throw it in a backpack before setting out on a hike. Once your case is packed it’s always ready. I actually have two different sized-cases that we alternate between depending on the destination. I take the large (fully stocked) case when we travel outside of the country or to remote locations. If what I need in a moment's notice isn't easily accessible at a CVS or Walgreens with in a block or two, that I opt to bring it along. When we return from a trip I make sure that I replenish anything that we used. Then it’s ready for the next trip. I have even found this mini-medicine cabinet to be useful for day trips near home. It’s always in one place and ready to go. Be sure to pack this case out of the reach of little hands. When traveling by car I recommend having it close and accessible. I like to keep it under the passenger seat where I can quickly grab it. For airplane travel I always put it in our checked baggage (holding back anything we may need before we arrive at our destination). This is just a personal preference, but with the tweezers and liquid form of some of the medication, I just don’t want to hassle with security. 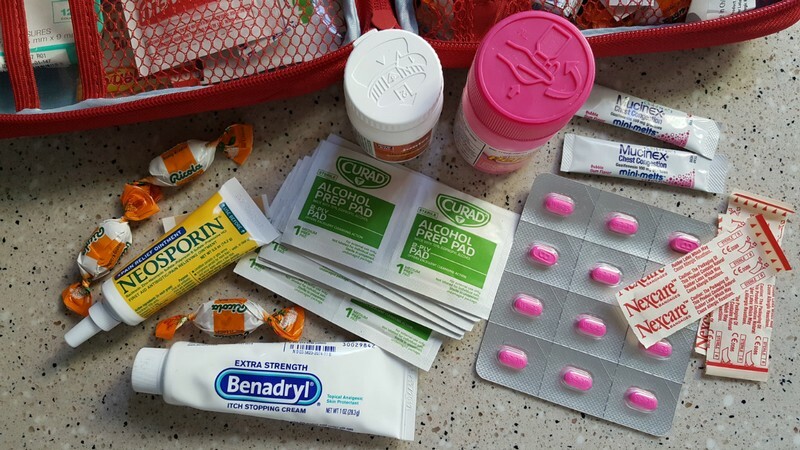 Cough drops, cough suppressant, acetaminophen, ibuprofen, thermometer, tweezers, eye drops, Pepto Bismol, Tums, bandages, gauze, alcohol wipes for scrapes, butterfly closures, antibiotic ointment, anti-itch cream and insect repellent. We also use some homeopathic supplies on a regular basis (such as essential oils) and I don’t want to be without them when we travel. 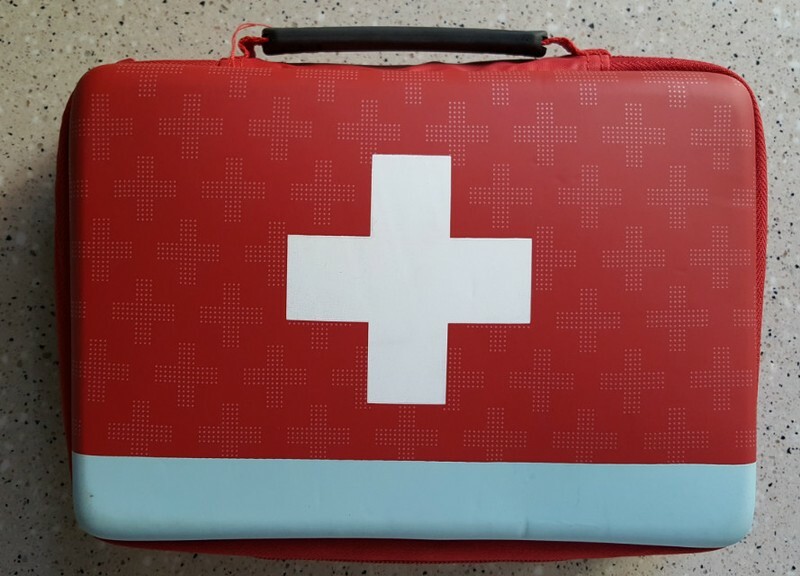 We can’t always avoid getting sick or having accidents when we travel, but it sure can help alleviate some of the problems when we take what we may need. What about you? Are there items you always pack for your family when you travel? I’d love to hear your feedback. Please share below in the comment section.